No Neo, not that Trinity. 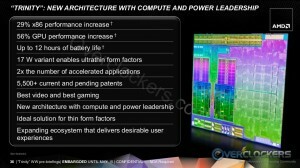 This is AMD’s new Accelerated Processing Unit (APU) architecture. 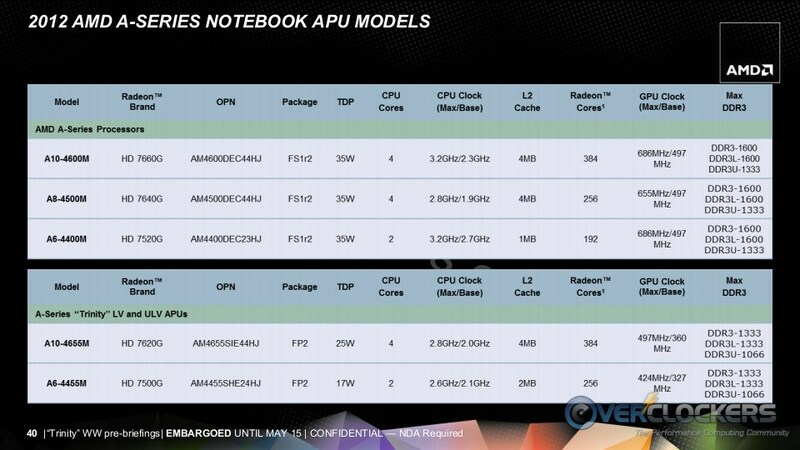 They are unveiling the APUs for notebooks today with desktop APUs to come down the road; we’re told sometime in June (can you say Computex?). AMD shared the nitty gritty with us for today’s launch, so we’ll dive as deeply as we can without having anything on-hand for testing. AMD even went a step farther, giving us the opportunity to speak with the notebook product manager for Trinity, Derek Johnson. For a notebook-guy to desktop-guy conversation, it actually went quite smoothly! 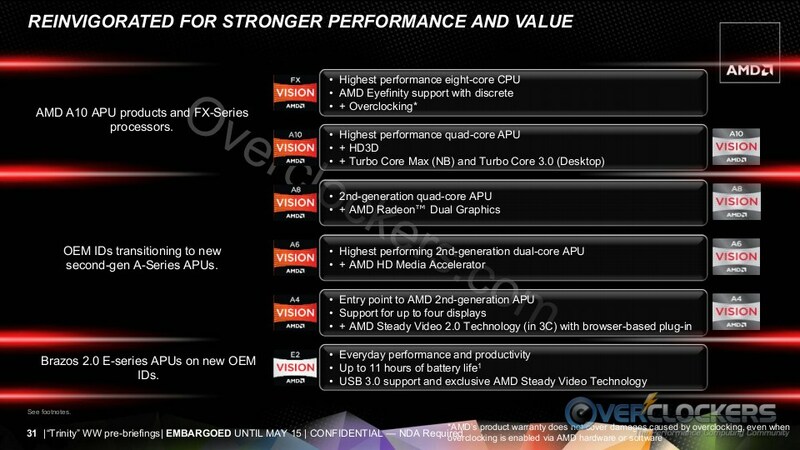 Before getting started, remember that everything you see here is from AMD directly. We do not have a Trinity APU to test or, more importantly, torture. At this point we’ll take their word for it, but you can bet when the desktop channel parts come to light we’ll do our best to bring you the best coverage we can. Let’s start with a big selling point for Trinity – Performance per watt (PPW …let’s also see how many three letter acronyms (TLAs) we can fit in one article). 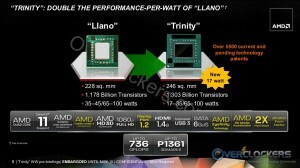 Trinity brings with it a TDP (Thermal Design Power…another TLA!) as low as 17 watts. That’s half the TDP of Llano, which bottomed out at 35 W. The amazing part is that they are drawing the same performance out of 17 W as they did with Llano at 35 W. That’s not a huge deal for desktop users, who will probably go with the more powerful 35 W TDP Trinity chip. 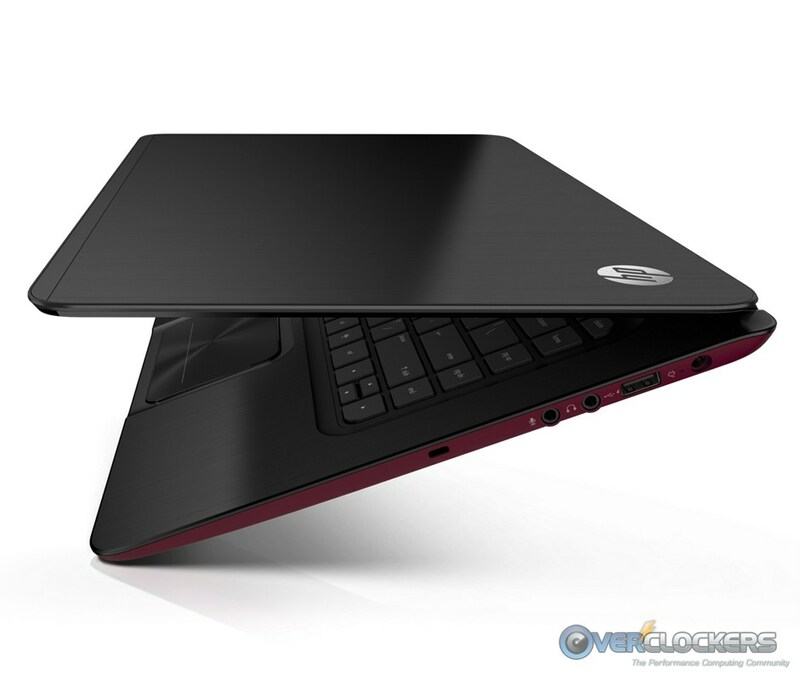 For ultrathin notebooks though, that is superb. Just think, Llano performance in a cool-running, battery-lasting ultrathin. There are enhancements to the APU as well. On the CPU-side, they have replaced four Deneb cores with two Piledriver modules. That will, of course, introduce the whole naming scheme problem they had with Bulldozer. There are four x86 integer cores inside a Piledriver CPU, but the whole thing (as yet untested) might end up a flop on the floating point side of things, just like Bulldozer. That said, Piledriver is improved over Bulldozer so for AMD’s sake hopefully that won’t be a huge deal. As far as the 35 W Trinity APUs go, they are anticipated to gain 29% x86 performance with a whopping 56% GPU performance increase. You’ll also notice that they have upgraded the GPU side to the Northern Islands architecture. Like the last generation APU, it uses the prior generation’s GPU core. In this case, Nouthern Islands (the 6xxx series GPU). There isn’t much to this next slide, but it was used in our conversation to touch on an important way they are going to be keeping costs for ultrathin AMD notebooks down. Apparently “the competition” (yea, that would be Intel) has certain requirements for meeting the Ultrabook classification. 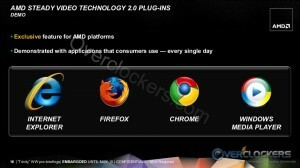 Rather than tying their OEMs’ hands like that, AMD lets theirs do as they please. 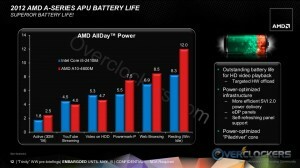 AMD makes the APU – the rest is up to the OEM. I asked for a specific example and Mr. Johnson was honest in that he didn’t know exact specifications required to qualify as an Ultrabook, but as quick examples he mentioned requirements such as mandatory use of an SSD, use of a certain case material in manufacturing, specific thickness, specific memory…all of which you can tell would drive the price of the computer higher and higher; especially the SSD part. Now the OEM can spec out a more budget-oriented Trinity system that will perform near or even better than an Ultrabook in certain respects without those specific, cost-raising requirements. I picture a features-selection screen with a plethora of options to deck your ultrathin Trinity notebook out with top-of-the-line components or skimp here and there to save a buck. 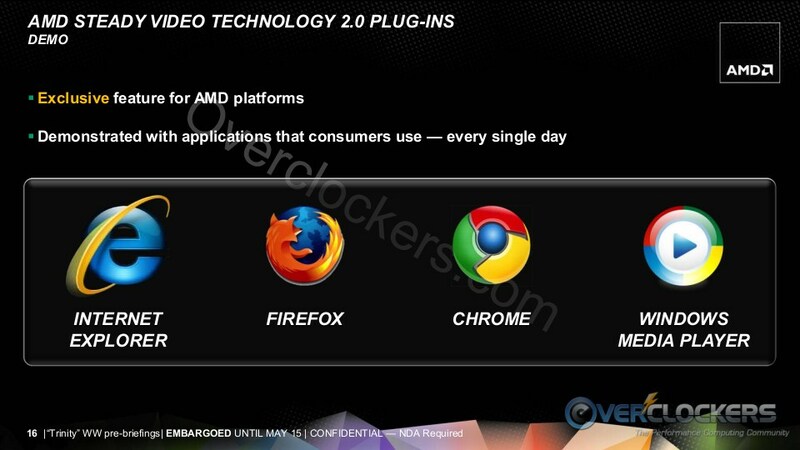 Without those restrictions, AMD says you’d be able to do that. Not so with the competition. With the halved TDP giving the same performance, battery life is obviously a leap over the previous generation, making the new 17 W part key for those users. 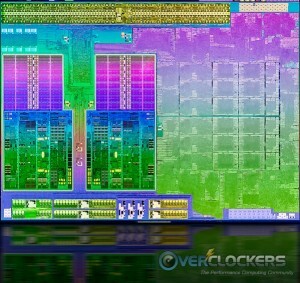 However, the 35 W A10-4600M can still last very close to or longer than Intel’s competitor, the i5-2410M (according to AMD). We don’t do a lot of notebooks here, but plenty of us have one and better battery life is always a good thing. One of the biggest parts of our conversation focused on media enhancements. 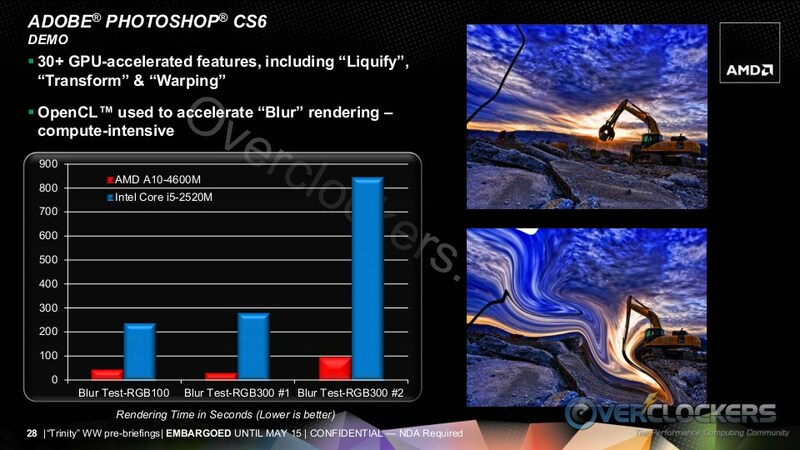 AMD is pushing the new APU’s clearer post-processing ability while watching video. With their Steady Video Technology, they can perform stabilization on the fly. 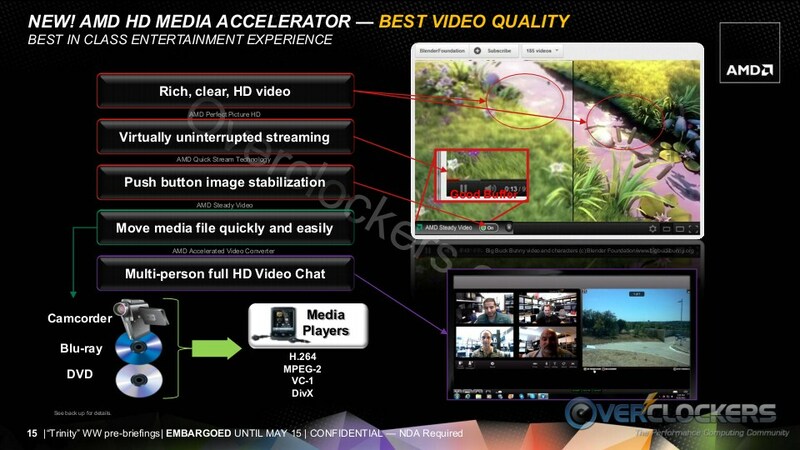 Rather than having to run that shaky hand-held video through a program to steady it before-hand, AMD has the ability to do that while you are watching it. That doesn’t apply just to files you’ve created or downloaded, but also to streaming media. Quick Stream is another feature that exists but will be invisible to the end-user. Quick Stream prioritizes streaming to allow your viewing experience to be worry-free. For example, say you’re multitasking by zipping a file, downloading a large file and watching something on YouTube or Hulu – all at the same time. Quick Stream will manage the available resources such that your viewing experience gets priority. No more “Buffering…” while your stream fights with your download for available bandwidth. Unfortunately, that is not user-configurable; at least on the notebook side. OEMs will be able to prioritize certain programs over others. This is conjecture, but it’s easy enough to see them turning a profit by focusing on their own bloatware – maybe Apple pays more for Quicktime to be prioritized higher than Windows Media Player – or pays for QT to be prioritized and for WMP to NOT be prioritized. I don’t know that’s what will happen and certainly hope not, but the skeptic in me always leans that way when you take control away from the user. It’s a blessing and a curse to have that sort of tech invisible to the consumer. AMD is also working with open source software authors, who have jumped on the opportunity to optimize their software to AMD’s architecture. 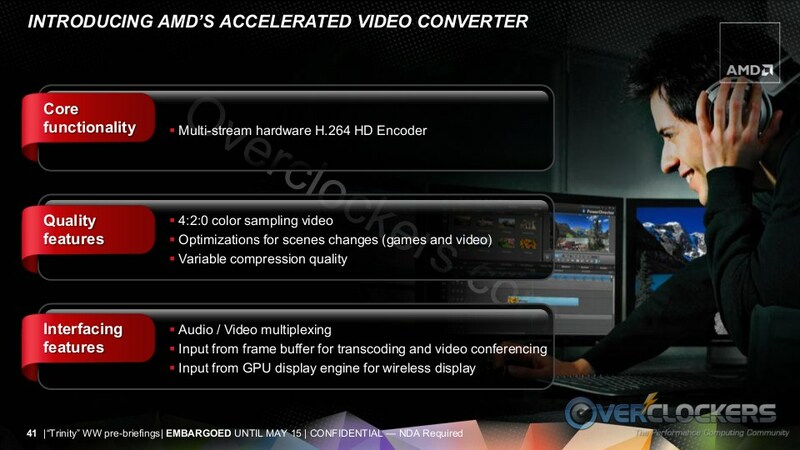 VLC Player, Handbrake, GIMP (GNU Image Manipulation Program – open source photo editor) and H.264 HD Encoder are all working with AMD to support their APUs. When posed with the question, AMD is well aware of the success of Intel’s QuickSync for video conversion and are “comfortable” in their position within the market for performance-per-dollar and performance-per-watt. Gaming is, of course, a big focus for AMD. 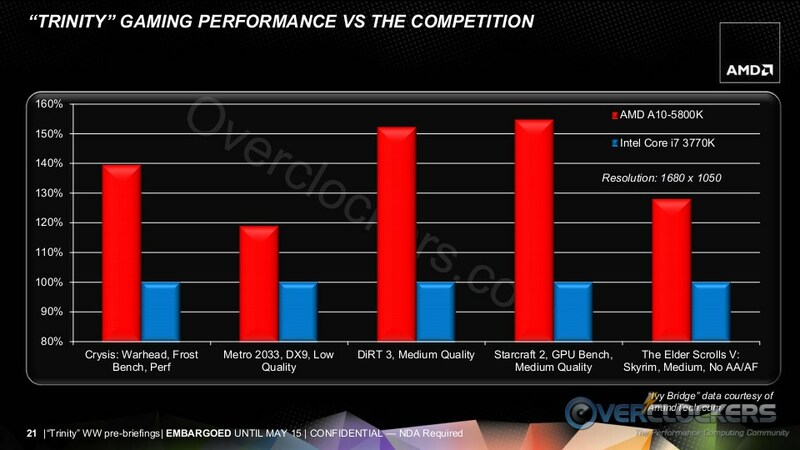 Their Llano A8-3870K already has stronger graphics than even the current-gen Ivy Bridge Intel iGPU. The A10-5800K just widens that gap even further. If you stay very far away from 2D Benchmarking comparison, the A10 looks very good. (For what it’s worth, the A10 is expected to cost a fair bit less than the i7 3770K.) Note the A10-5800K used in this slide – it’s the only desktop part for which we’ll see benchmarks for now. AMD has also focused on getting software makers on-board with their OpenCL acceleration. WinZip is a big one (I use 7zip because it’s free, but used to use WinZip once upon a time), with the A10-4600M showing performance gains over the i5-2520M. 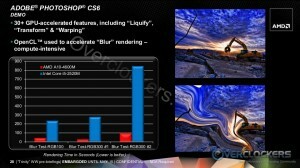 Another metric where OpenCL can improve things is with Photoshop; with CS6 Adobe is adopting OpenCL to help with image processing. On both the notebook and desktop sides, we’ll have the same opportunity to double-up on graphics as Llano. Adding a small discrete GPU increases gaming performance significantly. I’d expect the desktop configurations to look pretty similar to the ones listed here for notebooks. I’ll put this next one up because it breaks down AMD’s lineup and where their focus lies. 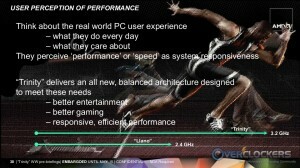 There is a lot of marketing on this slide (Highest performance eight-core CPU? 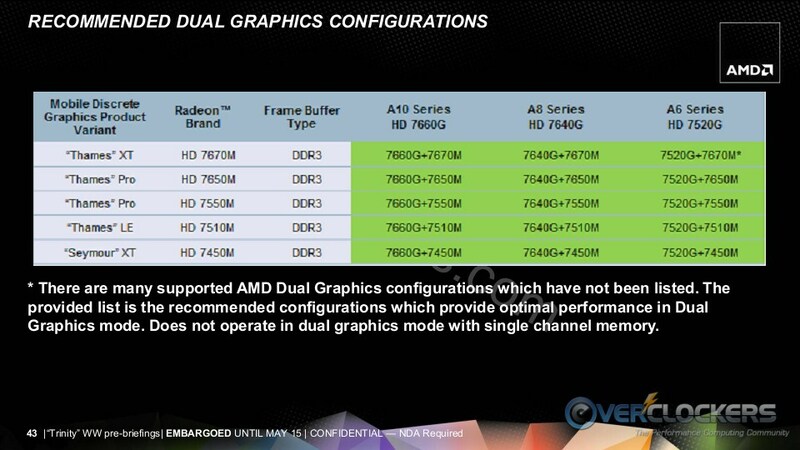 …compare it to an Intel quad core and get back to me), but it shows what AMD is shooting for with the different levels of their product stack. 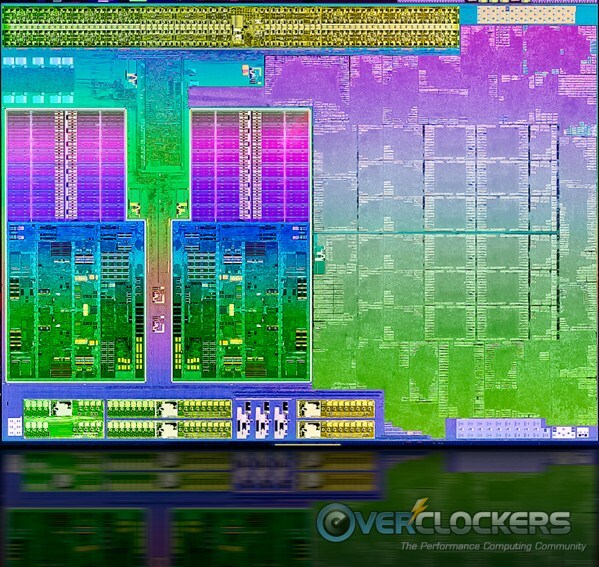 Since they’re still having a spot of trouble competing on the whole instructions-per-clock metric AMD is understandably trying to shift the focus. Still, they are all about the computing “experience”. There may well be merit to this and I can’t say there isn’t. Their claim is that if you use an AMD system and a comparatively priced Intel system side-by-side, you’ll enjoy the experience of the AMD system more – it will be a more smooth experience than with their competition. Now, I’m a numbers guy. Always have been. 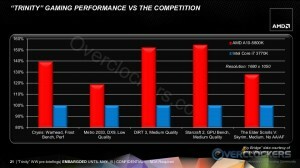 The numbers say Intel’s cores are just plain faster than AMD’s cores. I’m willing to give it a try though. When we get our desktop Trinity system in I’ll try it out for a while and see if I can tell the difference. 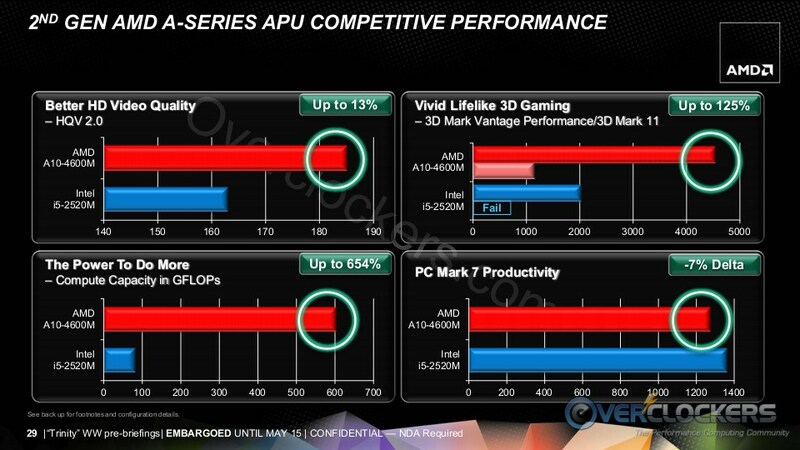 AMD deserves a fighting chance to see if it’s accurate. Hard to think it will be much better than the not-AMD system from which I type this (Z77 on the review bench), but comsidering the APU system will cost significantly less, I’d settle for parity to be honest. Today AMD is announcing their notebook parts, from the strong A10-4600M 35 W part down to the power-saving A6-4455M 17W part. 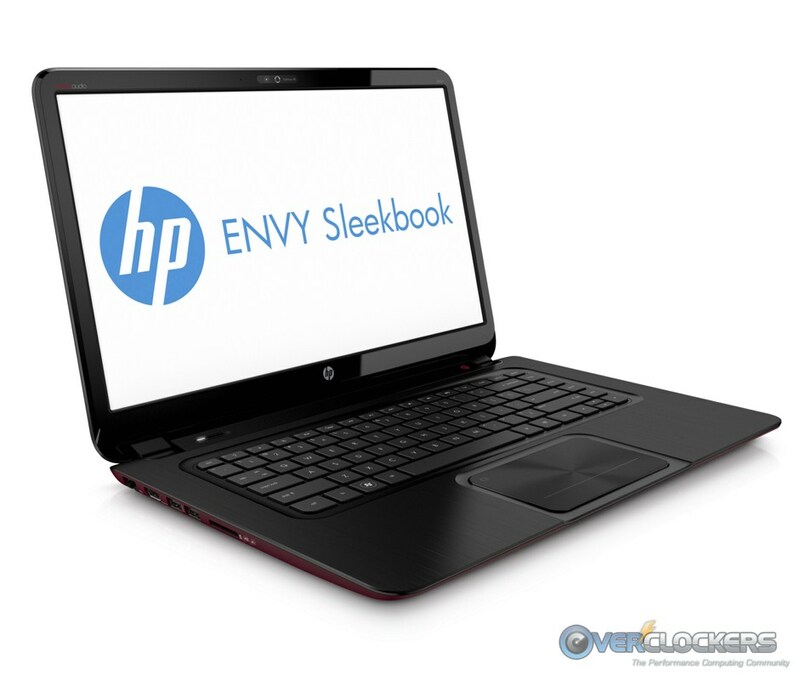 We’ve been shown a couple photos of the upcoming HP ENVY Sleekbook and it is one very nice looking ultrathin laptop. Did I mention it’s ultra thin? That is a really nice looking piece of hardware for sure. On the desktop side, we’re in for a wait. While June is the anticipated launch for desktop parts, that will be OEM only. 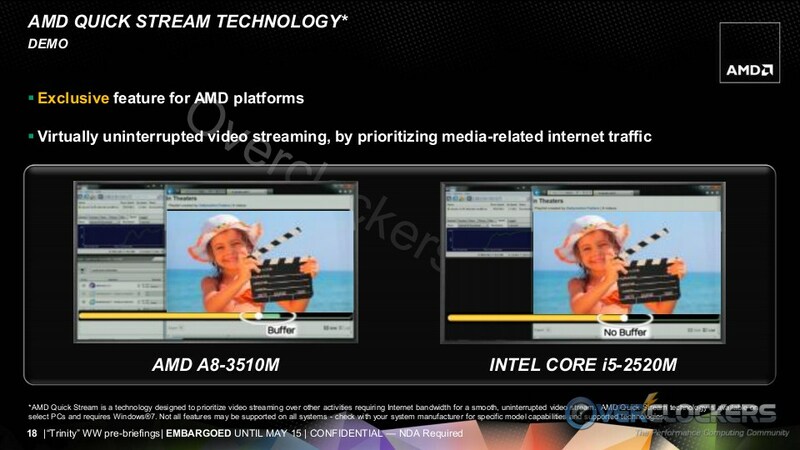 AMD couldn’t discuss any release timing for the desktop channel parts during our call. They did confirm one important fact though, mainly because it applies to the notebooks too. Trinity uses the same physical socket as Socket FM1, but it is going to be denoted the Socket FM2 and it is not the same electrically, meaning Trinity APUs will not work in Socket FM1 motherboards. Don’t fret, when AMD brings the desktop parts to market, we’ll be right there with the coverage you expect. Until then though, we’re excited to see how these ultrathins stack up against the competition in the mobile market. Are you considering a Trinity notebook? Too early without benchmarks? Let us know what you think! this cool, cant wait to see the desktop parts. Well, VR-Zone isn't impressed. Anandtech isn't unimpressed but they are on the fence until we see actual products. Seems like a mixed bag of 'depends on what you're looking for'. They wouldn't even talk about desktop channel part release yet, so we're probably looking at a fair bit of time before a Trinity system graces our site. Trinity may do well, but those graphs are misleading at best. All in all, I think I need to wait for reviews with product tested here on OCF..... Anandtech seemed to be less biased, though here we let the benches themselves do the talking. From what I've read so far, many sites seem to like it. It covers the low to mid range performance bracket quite nicely, and thats where most notebooks in the market a purchased. For AMD's mobile units to out perform Intel's in aspects that really mater in the mobile sector, and at a lower TDP is hugely important and significant for AMD. The main stream would like there Laptop to do occasional DX11 Gaming, stream HD movies smoothly and be solid for photo and video editing while having a good battery life and not costing a fortune. PS: Did they say it has a gain of 29% x86 performance over Lllano, Lllano being based on the K10 architecture, basically what you see in my signature, if so that bodes extremely well for Piledriver. I find that impossible to believe, i would be happy with ~10% over K10 if it also clocks higher. I want to see some traditional benchmarks. Thanks mjw21a, i did not go through all them completley, just the ones with decipherable benchmarks. Predictably those turned out to be mainly Anandbench and Tomshardware. The IPC performance on these mobile units is still not there with SB and IB, But it is way better than Llano and has closed some of the gap to SB / IB. 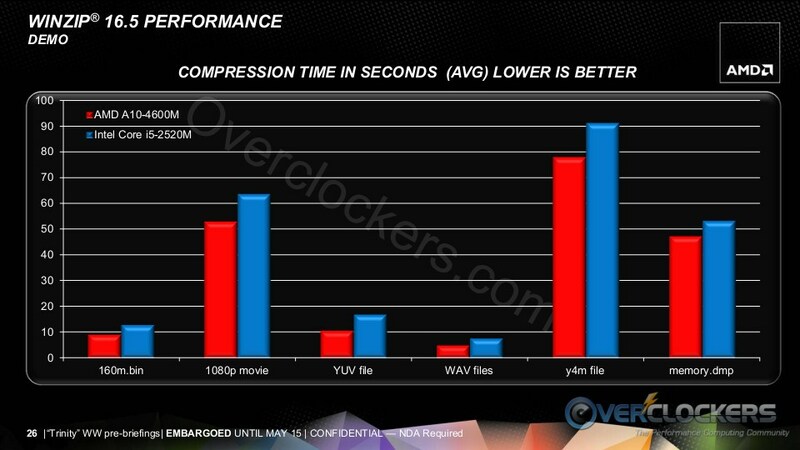 Intel's Quick synk still kills everything but the end result quality of that is not as good as standard encoding. Battery life is not quite as good as the best Intel based machines in there tests but close enough and again much better than Llano. On Gaming, predictably Intel's HD 3000 is no where compared to Trinity and the HD 4000 is also behind, but interestingly in a couple of benches Intel's i7-3720QM + HD4000 is a little ahead of the A10-4600M, which may well be down to the monster IPC in that chip making up for the HD4000 GPU short fall in some more CPU dependant games. 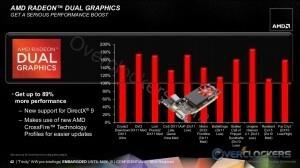 AMD have made (significant) improvements right across the board, and crucially they improved upon a chip that was already faster than Bulldozer. From what I've read, it's approx 7% better IPC over Llano..... To me thats a massive win all around. The other thing thats signifcant is that they so far just improved all the things that were easy to fix. Over time we're definitely going to see IPC improve with each new generation. 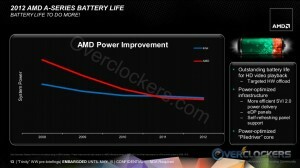 Anyone have any info on when AMD's moving to 28nm? They're doing unbelieveably well to stay as competitive as they are when they're so far behind on process tech. Yes, do you realise the implications of that? 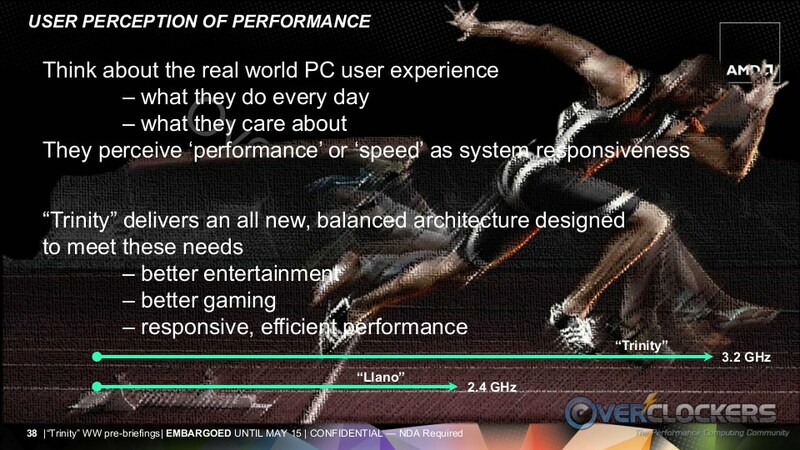 Llano is Phenom II, basically. 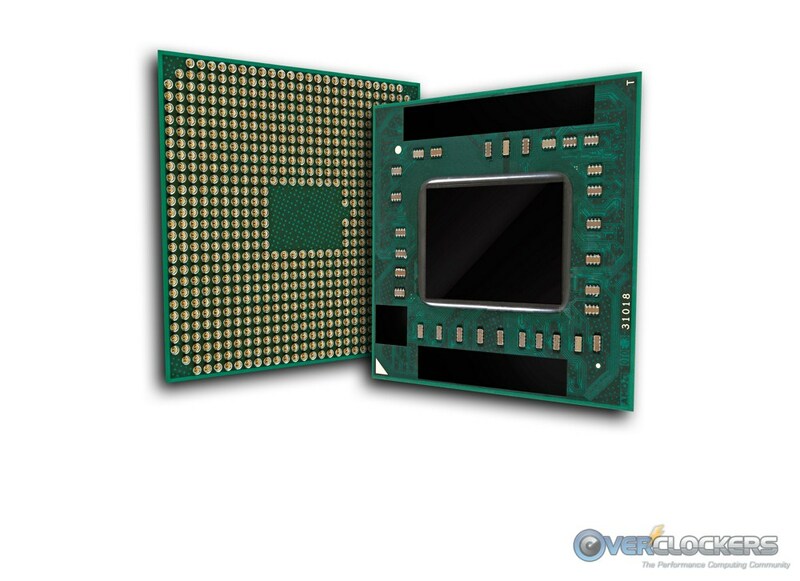 Oh look there is one here X4 940: 3Ghz vs A8-3850: 2.9Ghz scroll down a tad and look at the IPC dependent benches, take into account 2.9Ghz vs 3Ghz,- they match. Bulldozer is significantly behind Phenom II core for core / clock for clock. The (Piledriver core) Trinity is faster than Llano, by extension faster than Phenom II, there in Piledriver is a vast improvement over Bulldozer. I'm pretty sure with the (possible) implications of this, the full beans desktop FX-8350 is, while still not a match for IB clock for clock / core for core, snapping at its heals surely? add the higher clock speed into the mix, and? 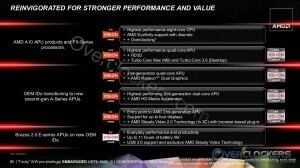 AMD appears to be moving in the right direction with the Piledriver cores! Trinity offers a nice mobile solution. Cannot wait until the Desktop units appear! Lol, of course I do. 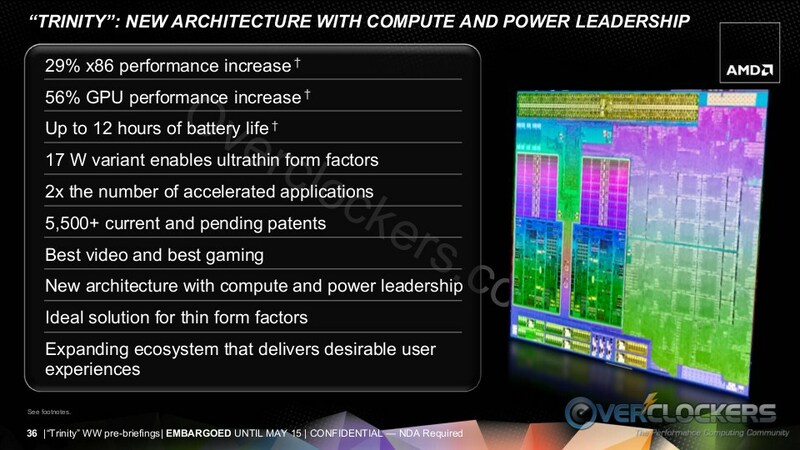 At this point in PD is the best architecture AMD has EVER released in terms of IPC, likewise I'm hoping it has the abillity to overclock through the roof. Comes down to whether its any good for overclocking on air though. If you need dry ice to get a decent overclock then that ruins it for me. This looks to be a turning point for AMD, however its also important to remember that Intels next revamp will be a change in architecture and they're likely to pull further ahead too. 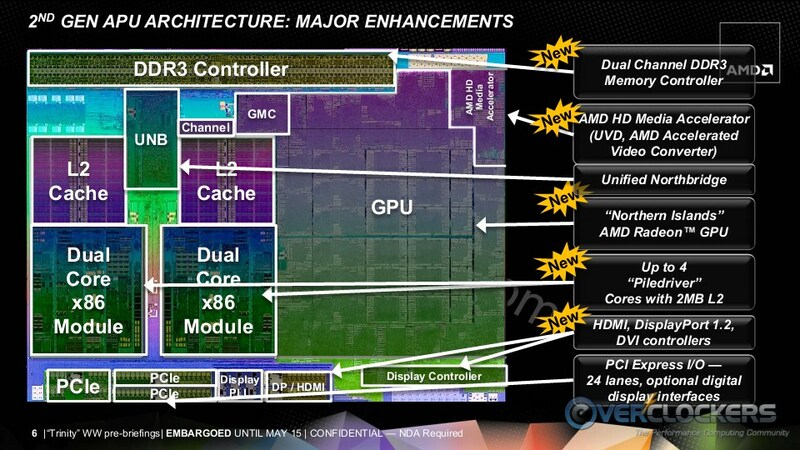 Mind you, we've had 2x AMD architecture releases in the time it took Intel to come up with Ivy Bridge. That is something significant too. When the desktop parts are released, I suspect the reviews may actually sit back and realise, wow, these are better than the Phenom II x6's. That has always been the main criticism of the FX's, that they're slower than the previous gen in so many tasks. 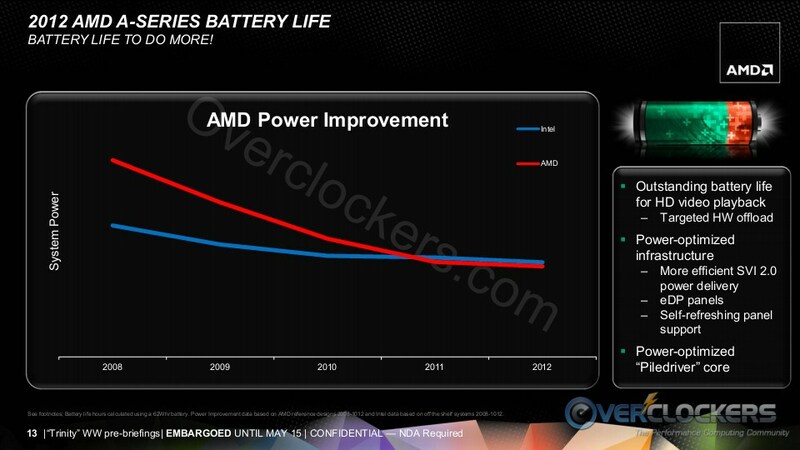 But even with that optimism, given AMD's recent track record i'm far from convinced, optimistic, but not convinced. Yet we will know before the FX-8350, the Trinity Desktop part is coming up. then we will know. Not wanting to put a spanner in the works but i have just noticed something, The Laptop part Trinity is running at a very much higher clock than the Llano Laptop part, i don't know right now what the scaling is but off hand it looks like that IPC performance gain is gone by the time Llano is scaled up.